What is mathematics about? Is there a mathematical universe glimpsed by a mathematical intuition? Or is mathematics an arbitrary game of symbols, with no inherent meaning, that somehow finds application to life on earth? Robert Knapp holds, on the contrary, that mathematics is about the world. His book develops and applies its alternative viewpoint, first, to elementary geometry and the number system and, then, to more advanced topics, such as topology and group representations. Its theme is that mathematics, however abstract, arises from and is shaped by requirements of indirect measurement. Eratosthenes, in 200 BC, demonstrated the power of indirect measurement when he estimated the circumference of the earth by measuring a shadow at noon, in Alexandria, on the day of the summer solstice. Establishing geometric relationships, solving equations, finding approximations, and, generally, discovering quantitative relationships are tools of indirect measurement: They are the core of mathematics, the drivers of its development, and the heart of its power to enhance our lives. What is mathematics about? Is there a mathematical universe glimpsed by a mathematical intuition? Or is mathematics an arbitrary game of symbols, with no inherent meaning, that somehow finds application to life on earth? Mathematics is About the World holds, on the contrary, that mathematics is about the world. The book develops and applies its alternative viewpoint, first, to elementary geometry and the number system and, then, to more advanced topics, such as topology and group representations. Its theme is that mathematics, however abstract, arises from and is shaped by requirements of indirect measurement. Eratosthenes, in 200 BC, demonstrated the power of indirect measurement when he estimated the circumference of the earth by measuring a shadow at noon, in Alexandria, on the day of the summer solstice. Establishing geometric relationships, solving equations, finding approximations, and, generally, discovering quantitative relationships are tools of indirect measurement: They are the core of mathematics, the drivers of its development, and the heart of its power to enhance our lives. This book is for anyone who wants to understand how mathematics relates to the world. But not all chapters are equally relevant to a particular reader. Chapter 1 “Euclid’s Method” is the most important chapter in the book. If you read only one chapter it should be this one. Chapter 1 identifies indirect measurement as the reason for a science of mathematics and depicts abstract measurement as the essential method of establishing connections in geometry. Chapter 2 provides a geometric perspective on magnitude, drawing out the relationships among magnitudes that underpin the application of real numbers to measure magnitude. Chapter 2 provides an essential context for chapter 4 on the real number system. If you read only three chapters, read chapters 1, 2, and 4. Chapter 3 is a continuation of Chapter 1, but more focused on Euclid’s geometry. Euclid’s fifth postulate is its subject: how it relates to the world and how Euclid uses it to measure area and to establish his theory of geometric proportion (the basis of trigonometry). Chapter 3 is optional in relation to the rest of the book and can be read at any time after Chapter 1. Chapter 4, a core chapter, offers a reality-oriented perspective on the real number system. Chapter 4 offers a reality-based reformulation of the standard “constructions” while rejecting the idea that numbers are constructed objects. Numbers are, rather, a way to identify and specify relationships in the world. Specifically, they identify ratios or the relationship of a multitude to one of its units. Chapter 4 closes by relating its approach to the work of Dedekind, Cantor, and Heine in the late nineteenth century. Chapter 5 is a very short chapter identifying a role for geometry (an abstract focus on the objects of measurement) that transcends its restriction to the measurement of three dimensional spatial relationships. As Chapter 5 notices, the application of geometric methods to numerical relationships and to magnitudes such as force dates back at least to Euclid and Archemedes. The last three chapters, 6-8, though written for a general audience, are intended primarily for college math majors and mathematically advanced high school students. These chapters are included to illustrate how my approach to understanding mathematics applies to advanced mathematics. They develop and motivate key concepts that are often (if not typically) left unmotivated in standard presentations and these chapters are essential reading for math majors who want to understand what they are being taught. Chapter 6 answers the question: “But what about set theory?” Chapter 6 finds a valid need for set theory in mathematics as a methodological device, but rejects any notion that set theory provides a foundation of mathematics. Closing with a brief discussion of the standard set theory axioms, Chapter 6 points out that, by design, these axioms, building an entire edifice on the empty set, are meaningless. Finally, as an illustration of the value of a proper set theory, Chapter 6 offers a motivation of the key concepts in point set topology. But be warned: This is the most difficult section in the book. However, the remainder of the book in no way depends on this section and any reader starting to get bogged down it is should skip to the next section. Chapter 7 motivates and relates key concepts in vector spaces and linear transformations/matrices. It should be read by anyone studying linear algebra. Abstract mathematical groups, discussed in Chapter 8, play an essential role in advanced mathematics and physics. Chapter 8 develops and motivates key concepts in group theory and group representations from an elementary perspective. To understand group theory one needs to broaden one’s concepts of quantity and measurement and Chapter 8 provides the required perspective. As such, it is the final test of this book’s central thesis. Chapter 8 should be read by anyone who wants to understand how group theory relates to the world. How does geometry relate to the world? How do numbers (especially irrational numbers) relate to the world? Chapter 1 answers the first and Chapter 4, on the basis of Chapter 2 answers the second. As presented in Euclid’s Elements, straight lines are infinitely thin, continuous and infinitely straight. Lines on earth, at the microscopic level, are none of these. So how can Euclid’s propositions apply to shapes and relationships in the world and how can his arguments reflect and capture relationships in the world? And if everything that we manufacture is shaped and measured according to our understanding of Euclid’s geometry is that to be expected or is it a happy accident? A closed figure with three straight edges is a triangle when, considered as a shape there are three relevant sides with no relevant bending or discontinuities. Euclid’s postulates are all primitive measurements, either of distance or direction. A Euclidean argument is a series of abstract measurements. It is a recipe for establishing the asserted indirect measurement by a series of more direct measurements, reducing ultimately to Euclid’s postulates. Chapter 1 is the first instance of the broader principle that a) we need mathematics to establish quantitative relationships to support indirect measurement b) we establish quantitative relationships by mathematical arguments that embody a series of abstract measurements. In sum, measurement is both the purpose and the method of mathematics. To rehabilitate numbers one does not start with the concept of number as if it were a given; one starts with the quantities that they are used to relate and measure. As the most interesting case, one starts with magnitudes. Numbers relate to each other the way that they do because of the nature of the quantities-the multitudes and magnitudes-that they measure. Zeroing in on these relationships, on what I call the pre-arithmetic of magnitudes, is the purpose of Chapter 2. As such, Chapter 2 sets the context for chapter 4, most especially for its discussion of irrational numbers. What does it mean to add magnitudes, as opposed to adding the numbers one might use to measure these magnitudes? What does it mean to multiply magnitudes, when is it meaningful, and what makes it meaningful? Why is length times width a measure of area? What does it mean to multiple a length times a weight? How did the ancient Greeks measure ratios of incommensurable magnitudes? For all their sophistication in comparing ratios of pairs of magnitudes, the Greeks had no mathematical means to express quantities such as speed. What is it that we take for granted that the Greeks were missing? What does the famous Axiom of Archimedes say about magnitudes? What makes the notion of a real line confusing? Why is that confusion hard to identify? And why is the real line, nonetheless, important? The main conceptual difficulty in Chapter 2 is to focus on quantitative relationships without thinking in terms of feet or pounds. And, where appropriate, to regard algebraic unknowns as standing for magnitudes instead of numbers. And, indeed, to keep in mind which unknowns stand for magnitudes and which ones stand for numbers! My hope, certainly my intention, is that the reader will find it worth the struggle. For those who decide to skip the section, the following discussion summarizes the essential points regarding the Axiom of Archimedes. The discussion also provides some orientation for those who persist. Finally, those who have previously encountered the Axiom of Archimedes will notice a contrast to the standard modern presentations. The Axiom of Archimedes usually takes the form that, given any positive real number x, there is a positive rational number less than x. In this form, the Axiom of Archimedes is involved in any demonstration that, given any real numbers x < y, there is a rational number r such that x < r < y. And this fact one depends upon whenever one uses decimals to approximate a number. I point out in the section that the Axiom of Archimedes does not come from a mathematical derivation, but is a basic observation about the world, specifically, about the nature of magnitudes such as length and weight. As I delineate in Chapter 2, the central import of the Axiom of Archimedes is that magnitudes are measurable; that any positive magnitude Y can be measured by any other magnitude X of the same type: that for any finite precision requirement, there exists a rational number A, such that Y = AX. That is, within the precision context, Y is indistinguishable from AX. Taking X and Y as concretely given magnitudes, I point out in the section that A is not unique, that for any prescribed precision standard there are multiple rational numbers A such that Y = AX. But suppose that X and Y arise in an abstract setting. Consider, for example, the relationship between the diagonal X and the edge Y of a square. In such cases, one wants a number A, not necessarily rational for which Y = AX regardless of precision context. In this example, one wants to show that A (in this case the square root of 2) is unique. I argue in this case, using the Axiom of Archimedes, that A is unique, point out that existence of A requires more argument, and defer that argument to Chapter 4. Finally, at the end of the section, I present the standard argument that, for any real numbers x < y, there exists a rational number r such that x < r < y. My approach to understanding Euclid, both mathematically and philosophically, is fully presented in Chapter 1. To understand Euclid’s method as abstract measurement is to understand both Euclid’s logical structure and, most critically, the way that Euclid’s geometry relates to the world. Chapter 3 continues the discussion of Euclid’s fifth postulate. It further examines the context of the parallel postulate and explains its application to Euclid’s theory of geometric area and geometric proportion. The 19th through the early 20th century, brought the transformation of mathematics from the science of quantity, with a Euclidean geometric base, to a formal system built on ontologically meaningless axioms. This transformation was driven by a philosophical perspective. But its occasion was a stage set by the development of non-Euclidean geometry and the later application of non-Euclidean geometry to Einstein’s relativity. These mathematical and scientific developments in no way impact my thesis that mathematics is about the world. It is not only true that the fifth postulate is independent of the other four, but, in light of its measurement implications, this independence should be expected. And since all measurements require physical means, one should not expect to understand geometric relationships established by light rays (general relativity) without reference to the nature of light rays. Yet the perceptual level remains the base and relativistic corrections consist in relating such relationships to the Euclidean geometry of the perceptual level. So the first part of chapter 3 examines the context of the parallel postulate. The measurement of area and the application of geometric proportion to trigonometric calculation is based, inescapably on the parallel postulate. In modern treatments, this relationship is hidden, even if it’s hidden in plain sight. In Euclid, this dependence is front and center and Euclid’s treatment provides a level of understanding and a perspective on area and proportion that is missing from modern treatments. Understanding area and proportion the way that Euclid did illuminates the geometry and provides an ideal theater for watching Euclid’s method in action. Elucidating these applications completes Chapter 3. Numbers are used to measure multitudes and, derivatively, to measure or relate magnitudes. Although a comprehensive treatment of number would need to start with multitudes, the intent of Chapter 4 is to focus on the more difficult application of numbers to identify or specify a relationship between two magnitudes. To grasp a multitude as a multitude is to have identified or distinguished its unit (any one of the items comprising the multitude). The multitude, as such, has a specific numerical value to be ascertained by counting. This is not the case when one grasps a magnitude: To measure a magnitude it remains to specify a unit. In either case, Chapter 4 holds that a number is an identification or specification of a relationship between two multitudes or two magnitudes of the same kind. This characterization is intended to include the case in which one relates a multitude or magnitude to a unit. Why do we need irrational numbers? Given that all precision is finite, how can we meaningfully distinguish irrational numbers from rational numbers? Is there a systematic way to specify real numbers (i.e., rational and irrational numbers)? How does the principle that all measurements have finite precision apply to the use of numbers to specify quantitative relationships? What does it mean to say that a (Cauchy) sequence of numbers converges to a number? What does it mean to say that the real number system is complete? How should one regard the construction by Dedekind or, respectively by Cantor, of the real number system? Geometry, from the start, was about more than plane and solid shapes. When Pythagoras arranged pepples in various shapes, he was, certainly, studying shapes, but he was also studying numbers. Two centuries later, Euclid was drawing lines, in Book VII, to illustrate the rightly celebrated Euclidean Algorithm, used, to this day, to find the greatest common divisor of a pair of numbers. The Euclidean Algorithm is a cornerstone of number theory. But one can also apply that very algorithm to the edge and diagonal of a square, discovering, rather quickly, that the algorithm will never terminate. It cannot terminate because the two magnitudes have no “common measure.” The magnitudes are incommensurate. Geometry, for the ancient Greeks, was a perspective and a method. And they applied both the geometric perspective and their geometric method to the entire domain of quantity. Chapter 5, “Geometry and Human Cognition” closes the Elementary section of the book and is, by far, the shortest chapter in the book. Its purpose is to understand the pervasive role of geometry in mathematics, to indicate its scope, to distinguish and relate the geometric perspective and the measurement perspective, and to apprehend the cognitive contribution of the geometric perspective. Chapter 5 pulls together themes from the first four chapters and sets the stage for the remaining 3. On a personal note, I have been fascinated by the role of geometry in mathematics since my undergraduate years. This chapter began life as a significantly longer essay, with the same title (never published). It contained, in embryonic form, the key underpinnings of Chapter 1, which is the foundational chapter of the entire book. Chapter 2 also began as a short section in that earlier essay. Chapter 3 is a continuation of Chapter 1. And the book, as a whole, grew out of an exploration of themes first introduced in the early essay, “Geometry and Human Cognition.” Yet the core of the original essay, after all the excisions, remains intact, interesting, and important, providing a coda to Part 1 before the more advanced and demanding Part 2. The validity of set theory in general or, at least, the formal axiomatic approach to set theory, is highly questionable in a reality-based approach. If set theory is valid, or can properly be rehabilitated, a reality-based answer to the question: “What is a set?” is essential. One needs to address the key question: What, properly, would be the measurement function performed by sets? What is a mathematical set? How does a set differ from a concept? In what sense is a set open-ended, like a concept? In what sense is it not open-ended? What is its proper sphere? What measurement-related function does it serve? Proper domain of set theory. Set theory as specifically applicable to mathematics. Mathematics conceptualizes the world with respect to measurement of differences. Set theory as presupposing mathematical concepts. An indication of proper hierarchy in mathematics. Sets as a) primitive measurements b) performing a function of isolation c) a perspective on distinguished objects of measurement. A reality perspective on set theoretic “constructions.” Constructions as recognitions of relationships among quantities. Point set topology as a non-trivial and important application of sets. What is the purpose of point set topology, how does it relate to measurement, and why is it important? To repeat the warning: This is the most difficult section of the book, especially to someone who has not already studied point set topology. Consider skipping to the next section on the ZF axioms of set theory. Axioms of set theory, context and nature of the ZF axioms and their application to mathematics. Critical comments. Linear algebra, the study of vector spaces and linear transformations or matrices, began as the study of simultaneous linear equations. It is indispensable for its applications to physics and engineering and a necessary foundation for mathematical studies beyond the calculus. For many, a class in linear algebra is a first encounter with a more abstract approach to mathematics. The implicit concept of a vector as a directional quantity dates back at least to Archimedes in his treatment of buoyancy and his celebrated law of levers. The study of simultaneous equations, still the core of linear algebra, is even older, dating back to the Babylonians, 4000 years ago. Yet these ideas were not fully integrated until the 19th century and the first formal definition of a vector space was finally provided by Peano in 1888. Linear algebra, the subject of Chapter 7, provides an ideal case study for a number of reasons. First, it is advanced, college level, mathematics, but not too advanced. It is the first mathematical topic that a mathematics or science major generally encounters after calculus, less specialized, for example, than differential equations. Linear algebra is abstract, but not too abstract. It can be pursued on a very concrete level, but, for that very reason, it can be used to illustrate the value and power of mathematical abstraction. Secondly, linear algebra illustrates the interplay between the geometric and measurement perspectives in mathematics. This is particularly evident in the relationship between linear transformations (a geometric perspective) and their coordinate expressions as matrices (a system of measurements). Abstract arguments in linear algebra generally involve the geometric perspective for which the choice of a coordinate system (or a set of “basis” vectors) is treated as an omitted measurement. The measurement-omission principle also provides an illuminating perspective on so-called “quotient vector spaces.” The idea of an algebraic quotient is wider than the concept of a quotient vector space and has fundamental importance in higher mathematics. But the same underlying principle, that of measurement omission, is always, at least, implicit and it appears most transparently in the study of vector spaces. Finally, vector spaces illustrate the transition from the concrete to a more abstract perspective. On a concrete level, the space of potential spatial displacements in all directions is obviously different from the set of quadratic polynomials with real coefficients. Yet they are both three dimensional vector spaces that can be put into an exact correspondence; any argument concerning three dimensional vector spaces applies equally to both. To thus focus on mathematical structure is to treat the specific referents of each vector space as structurally irrelevant, as omitted measurements. Vector spaces and matrices are a conceptual underpinning of our civilization. 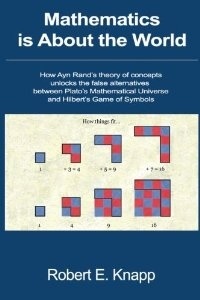 Chapter 7 highlights the value and nature of mathematical abstraction, the interrelationships between the geometric and measurement perspectives, and the illumination provided by Ayn Rand’s measurement-omission principle. To understand the role of measurement and the importance of indirect measurement is to isolate the precise sense in which mathematics is about the world. It is to appreciate the drivers of its development and why mathematics is so fundamentally important. Every chapter reflects aspects of this theme. Chapter 1 argues that Euclidean geometry applies to shapes and geometric relationships existing on Earth. To address the issue of finite precision, it construes a Euclidean argument as a recipe for a series of abstract measurements. A geometric proposition applies to any context in which the relevant precision requirements are met. If magnitudes and relationships between them (Chapter 2) are the metaphysically given objects of measurement, numbers (Chapter 4) are the identifiers and specifiers. From this vantage point, Chapter 4 provides a real-world perspective on convergence and completeness of the real number system. It is said that the end of the 19th century saw the end of mathematics as the science of quantity. But, to misquote Mark Twain, reports of the death of quantity have been greatly exaggerated. As Chapters 6 – 8 illustrate for topological spaces, vector spaces and abstract groups, 20th century mathematics is still about measurement of quantity. Indeed, our sensitivity to quantitative relationships and differences lies at the heart of the conceptual process itself. To say it, once again: The tools of indirect measurement are the core of mathematics, the drivers of its development, and the heart of its power to enhance our lives. The measurement-omission principle also provides an illuminating perspective on so-called “quotient vector spaces.” The idea of an algebraic quotient is wider than the concept of a quotient vector space and has fundamental importance in higher mathematics. But the same underlying principle, that of measurement omission, is always involved and it appears most transparently in the study of vector spaces. This is a first posting on Chapter 6; there may be others. Point set topology as a non-trivial and important application of sets. What is the purpose of point set topology and why is it important? On a personal note, I have been fascinated by the role of geometry in mathematics since my undergraduate years. This chapter began life as a significantly longer essay, with the same title (never published). It contained, in embryonic form, the key underpinnings of Chapter 1, in turn, the foundational chapter of the entire book. Chapter 2 also began as a short section in that earlier essay. Chapter 3 is a continuation of Chapter 1. And the book, as a whole, grew out of an exploration of themes first introduced in the early essay, “Geometry and Human Cognition.” Yet the core of the original essay, after all the excisions, remains intact, interesting, and important, providing a coda to Part 1 before the more advanced and demanding Part 2.